At Owl Now Urgent care, we are dedicated to providing prompt, compassionate care to patients in Lakeland, FL and the surrounding area. If your medical condition requires swift attention then you can count on Owl Now to provide you with the treatment that you need. Walk-in-clinics are a viable option for patients who do not require urgent medical attention but may need to see a doctor outside normal business hours. Because Owl Now Urgent Care is open daily and on Saturday and Sunday, we are also available for walk-in treatment needs. If you need treatment right away that is not serious enough for an emergency room visit, then Owl Now Urgent Care is your best option. Some conditions such as broken bones, sprains and cuts are non-life-threatening but still require immediate care. Urgent care was designed to treat conditions such as this, spanning the gap between an emergency room visit (which is ideal for life-threatening issues) and a regular doctor’s visit (which is preferred for patients whose conditions are not serious and who can afford to wait). A visit to an urgent care facility is going to be more convenient and affordable than a visit to the emergency room. Often copays for urgent care facilities are less than those for an ER visit. So long as your injury or illness is not life-threatening, visiting an urgent care facility is likely going to be your best option in terms of convenience, cost, and quality of care. Owl Now Urgent Care is open daily from 10:00 AM to 10:00 PM. We are even open on Saturday and Sunday as well as holidays. We are ready to provide you with the prompt, compassionate care that you need and accept most all major insurance providers. 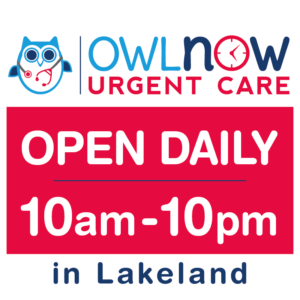 If you would like to visit Owl Now Urgent Care, we are located in Lakeland at 3240 S. Florida Ave. Suite 101. Excellent customer service and care. Reasonably priced, and helped my 3-year-old daughter with an ear infection. Highly recommend.